Sometimes you’re just in the right place at the right time and the unexpected happens. Steve Race from Yorkshire Coast Nature was up for a week, to photographically explore the Shetland Isles. Every photographer who visits Shetland have their target species. Red necked phalarope are a northern breeding species and Shetland is lucky to have nearly the entire UK breeding population. However, this only counts for handful of breeding pairs. 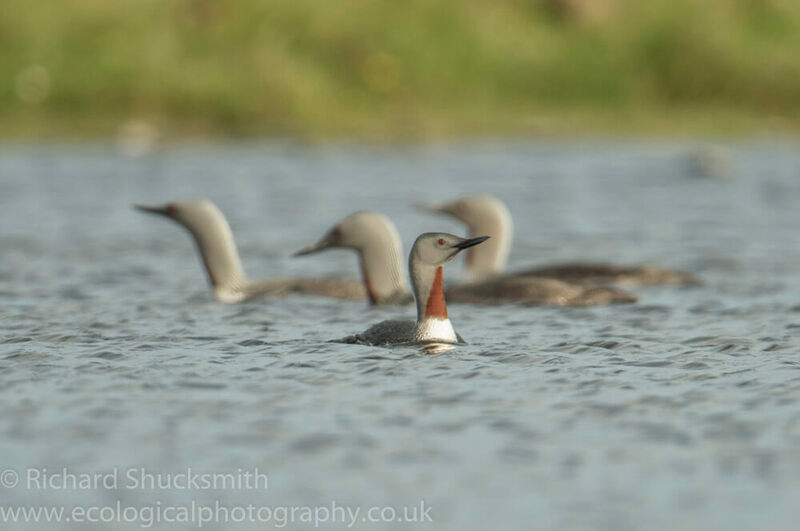 One of the best and only place to see red necked phalarope in Shetland, is at the RSPB hide at the Mires of Funzie, where the phalaropes can be seen in their nesting habitat. Closer views are likely along the roadside shore of the Loch of Funzie where the birds come to feed and bathe. At this loch you can also see red throated divers. We headed over to Fetlar to spend a day sat on the side of Loch Funzie, looking for phalarope. None showed, but there was a pair of red throated divers sat in the middle of the loch that flew off, half way through the day. We sat by the loch for over eight hours but with no luck we headed home to go and look for otters. Over the next couple of days we explored Unst and being on the Northern Isles, Steve and I decided to go to Fetlar on the way back to mainland Shetland, to have another look to see if we would be lucky enough to find a phalarope. Before we knew it, we were back on the side of Loch Funzie scanning for phalarope. Neither of us felt that confident, none had been sighted that week but we worked hard over the next few hours. Steve went off to the RSPB hide and I stayed on the side of Loch Funzie. 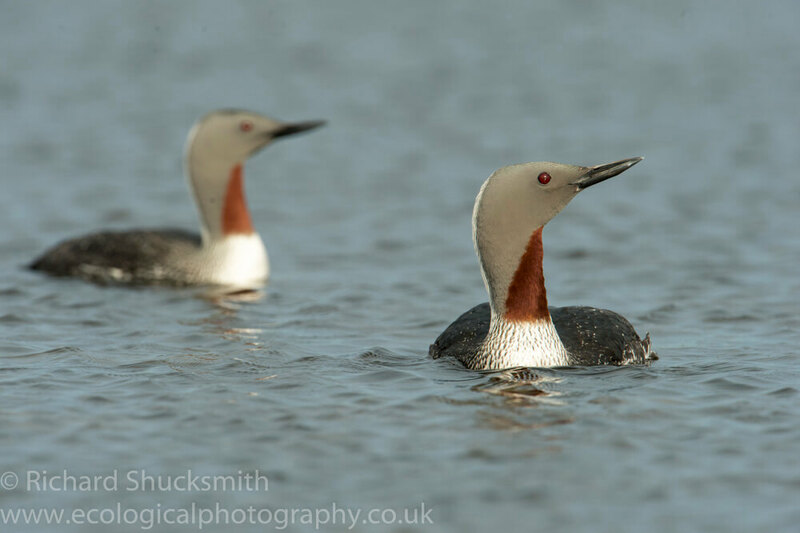 A pair of red throated divers came in, and proceeded to swim within twenty meters of the shore in front of me. They went to sleep and slowly drifting back to the opposite shore, due to the offshore wind. Steve walked back over and we discussed our options, coming to the conclusion we would have a break, nip to the shop and get lunch. On our return, we decided we would take it in turns to grab a little sleep, as we were surviving on three to four hours sleep a night. I had fallen asleep in the van parked, while Steve sat by the loch scanning. On awakening looking out, I saw two red throated divers not that far out, and then another which was only about five to six metres out from the shore, alongside the road. Steve was about fifty meters away watching. At this point some tourist came walking along the road. I sat there, thinking well that diver will move out into the loch or fly off. However as they walked along the road, right in front of the diver, the diver never moved and then they sat down and started taking pictures. Before long there was five or six people and the diver just sat there and started preening. Suddenly I was wide wake, Steve came walking up to the van, and after assessing the situation we both decided to take our cameras and move just past the tourists to get a better angle for the light. 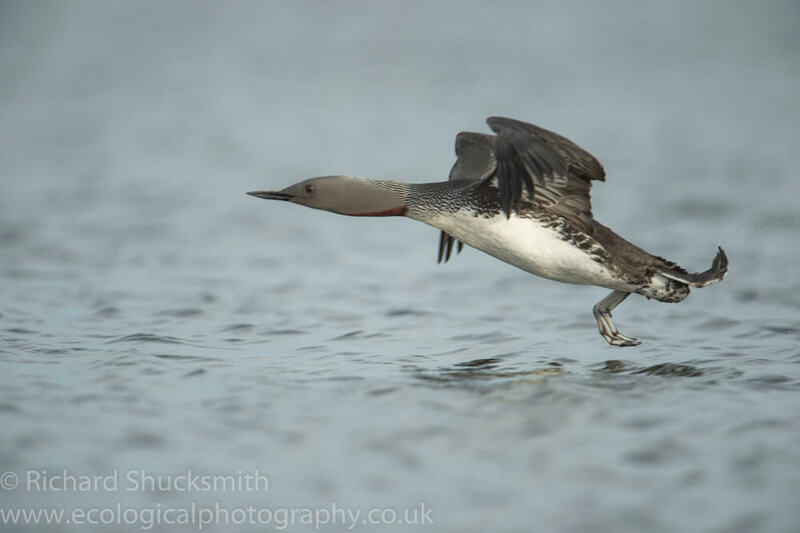 Over the next four to five hours we photographed and watched some of the most incredible red throated diver behaviour I have ever witnessed. 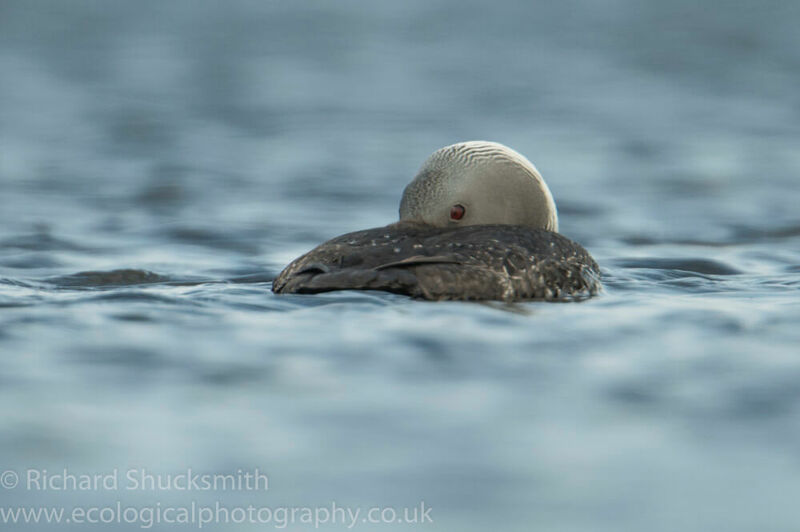 With up to seven birds on the loch at one point, one pair of divers was holding territory and did not want the others on there. One diver actually came towards us, every time we slightly moved position to get better light the diver would move to us and sit about five to six meters away, just off the shore. For the first couple of hours there was three birds, the pair and a single bird. They were all just off the shore a few meters out and looked to be living in harmony, even all falling asleep and preening. However, close observation showed that one of the pair even though the head was tucked under its wing, kept an eye open and was shadowing the single bird. In the morning when the pair had gone to sleep the offshore wind had slowly pushed them to the other side of the loch. This time they were maintaining position and keeping relatively close to the single bird that was trying to keep some distance between itself and the pair of divers. Suddenly more divers landed on the loch and things became more tense. All the birds looked more alert and the haunting calls of a diver started. 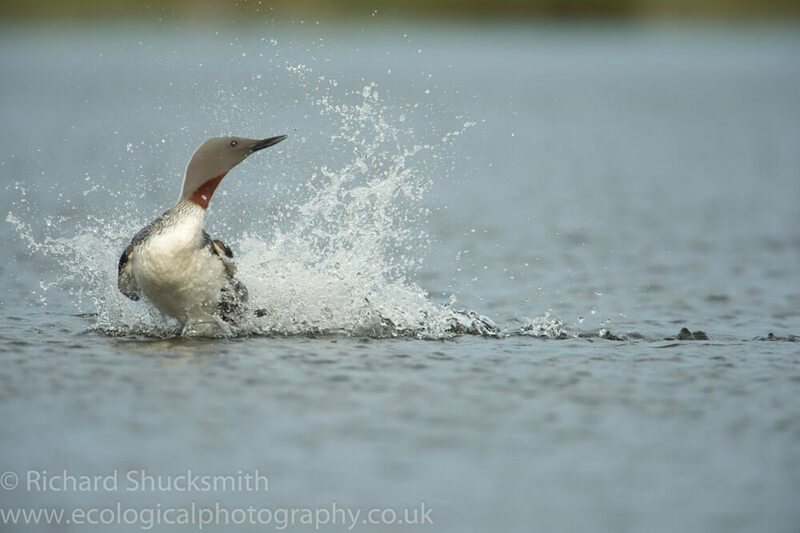 Suddenly the pair of divers dived and the single bird came right into the shallows, looking very tense, there was an explosion of water as one of the divers came up under the single bird, and a short fight resulted in the single bird taking off, only to land on the loch again. Over the next three hours, all within a few meters of the road, there was several skirmishes, lots of calling, taking off and landing. It was fascinating to watch and we had to leave to get the last ferry, time had ran out, light had fallen but it was still ongoing. It was an incredible experience. 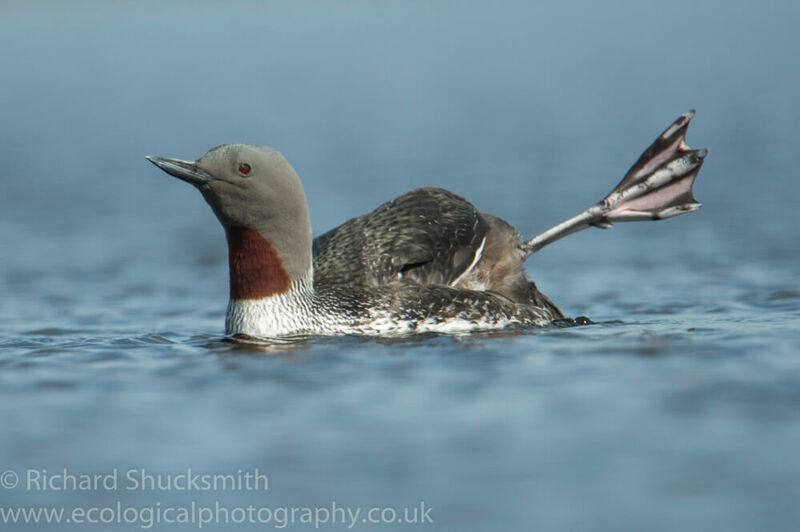 Red throated divers are sensitive, and listed as a schedule 1 bird along with the red necked phalarope. Schedule 1 birds means: Birds and their young, for which it is an offence to intentionally or recklessly disturb at, on or near an ‘active’ nest. 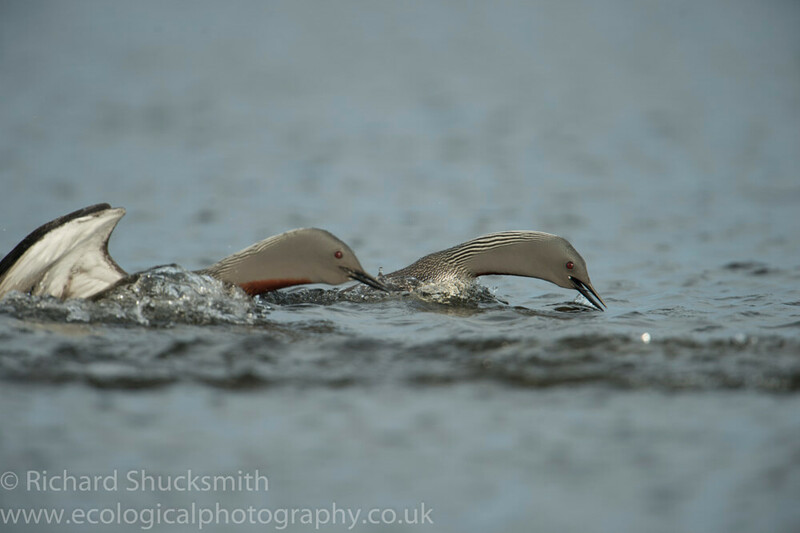 We were lucky to be sat by a lochan that is advertised as a place to see phalarope, people are encouraged to visit and were lucky to see the divers interact in this way. 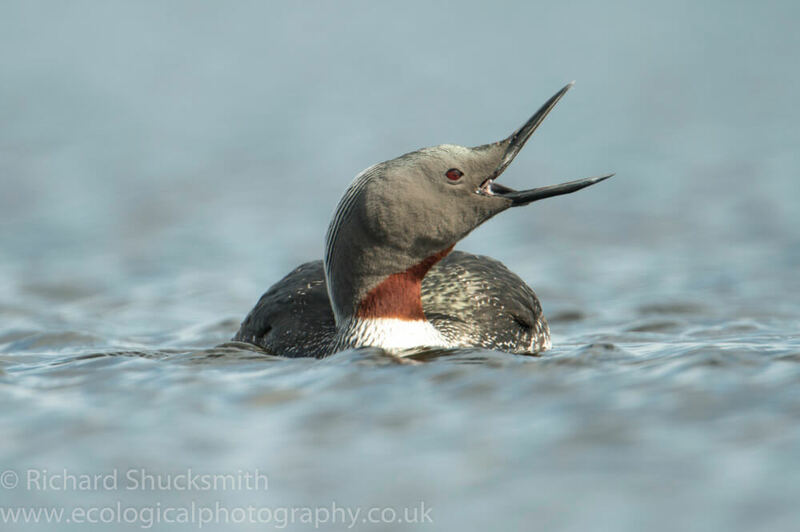 I would not go to any other lochan that I saw divers on at this time of year, as there is a strong possibility they are nesting and that I could disturb the divers, it could cause the divers to have breeding failure, it would be an offence to do so and I could be prosecuted. 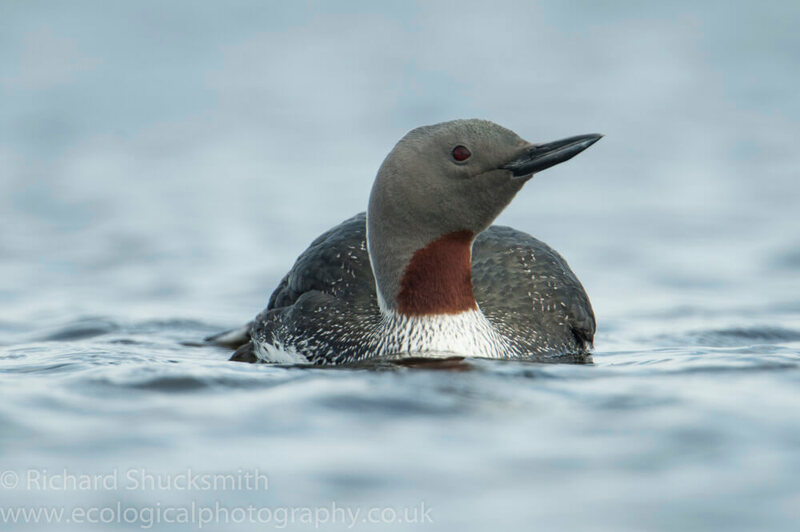 It’s just not worth it for the birds sake and you can great views of red throated divers by the coast feeding along the coastal edge, all around Shetland during the summer. Or you can be lucky lie us and see this behaviour at a public place like Loch Fumzie.